Food Hunter's Guide to Cuisine: Pistachio Layer Cake...Best Cake Ever! Pistachio Layer Cake...Best Cake Ever! This year my birthday really stressed me out. It had nothing to do with age, I'm way past that, but rather because of the cake. Let me try to explain: in order for things to be "right" in my world I need to have the "perfect" birthday cake; and I need to make it myself. So even though my best friend, who is a great cook, offered to bake the cake of my choice I couldn't relinquish this task to her. I'm usually pretty predictable with my cake; it has to be some sort of chocolate creation. I "pin" ideas to "my someday" board on Pinterest all year long in anticipation of the big day and the majority are chocolate. But as it got closer to my birthday I realized this year I didn't want chocolate. Hence the stress. Everyone kept telling me not to worry, that I would find a cake before the big day and it would be perfect. 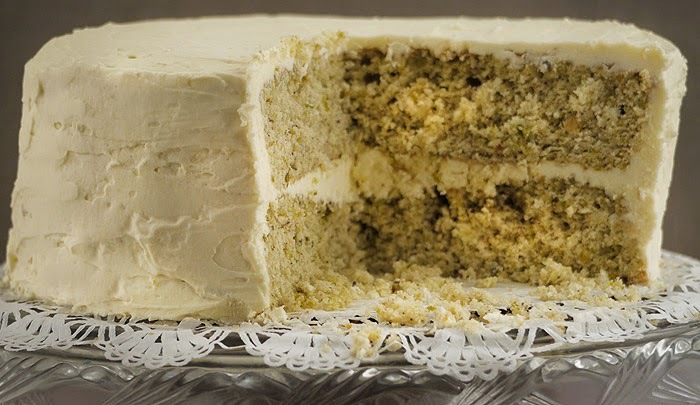 Perusing some of my favorite blogs I came across a Pistachio Layer Cake on Eats Well With Others. It sure looked good but was it "perfect"? I immediately tweeted Joanne and asked her if she thought it would make the "perfect" birthday cake. When she responded back it was to be her wedding cake that pretty much sealed the deal for me. The cake is simple to make...the icing is a bit intense but one bite and you'll agree that it's the best cake ever. If you have a special occasion coming up...yes, your birthday counts or just want to indulge make this cake! I can't stress enough how good it is. Preheat the oven to 325. Grease and line two 9-inch cake pans with parchment paper. In the bowl of a food processor, pulse the pistachio meat until it is coarsely chopped. Remove 2 tbsp to a small bowl. Pulse the remaining pistachios until they have almost a powder-like consistency. Transfer to a large bowl and whisk together with the all purpose flour, cake flour, baking powder, baking soda, and salt. Set aside. Turn the mixer to low. Pour 1 1/2 cups ice water into a measuring cup. Add the flour/pistachio mix to the batter in three additions, alternating with the ice water, mixing each time until just combined. Scrape down the bowl and mix on low speed for a few more seconds. Add in the vanilla and continue mixing until combined. If the frosting is too soft, chill it and mix again. To assemble the cake, place one cake layer top side up on a serving platter. Use a long serrated knife to cut the top so that it is flat and even. Spread a little over a cup of frosting on top. Add the remaining cake layer and trim the top again. Spread cake with a very thin layer of frosting for the crumb coating. Put in the freezer for 5-10 minutes. Spread the sides and top of the cake with the remaining frosting and decorate as desired. Pistachios are one of my favorite nuts - and I've never had a pistachio cake! I've been missing out! I love pistachios and so does my family! Definitely making this! This would make for the perfect birthday, for sure. I'm not a big pistachio fan, but your cake sure looks beautiful! I love this!! Pistachio cakes are my favorite. I have never had pistachio cake. Looks like I should. Pistachio are great but I have never had them in cake before! the frosting and cake make me want to dive into the photo just love it! I love cooking with pistachios too. Can't wait to make this cake. PIN-ing it to save for later. We love pistachios too! This looks like a terrific treat! That looks terrific! Hope the birthday was wonderful! Thank you for linking at the In and Out of the Kitchen Link Party. Hope to see you again next week.